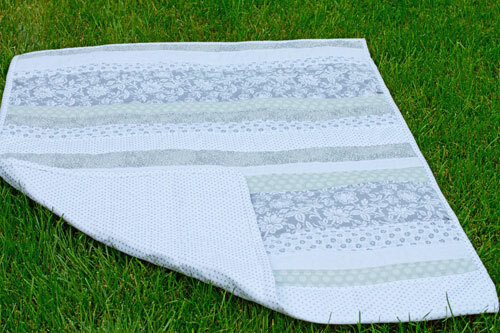 I have been wanting to try a strip quilt for a long time and when the opportunity arose to make another baby quilt I decided it would be the perfect project. 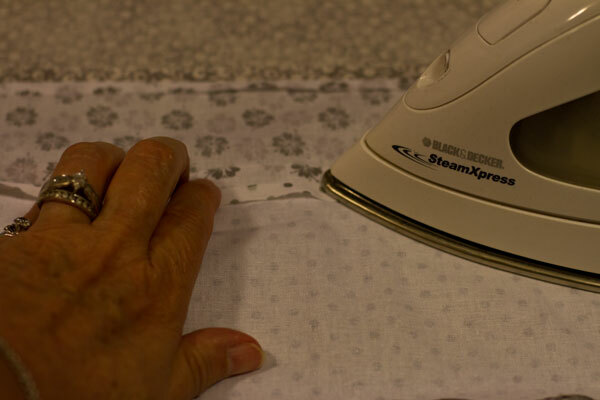 Strip quilts are often made to use up leftover scraps of fabric since they are just long strips of fabric sewn together. For this particular quilt I wanted to keep the colors somewhat neutral so I did a little fabric shopping. 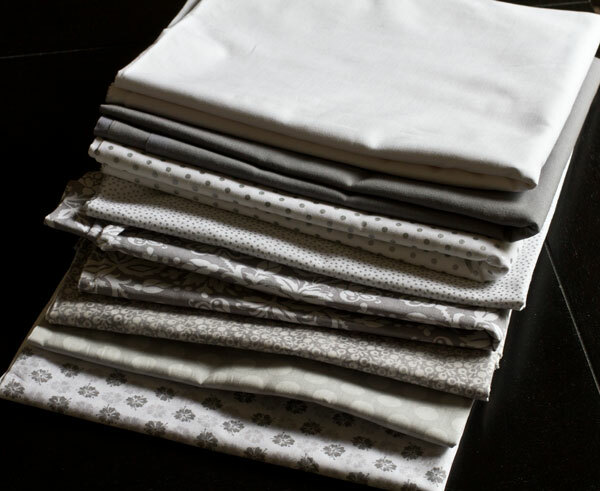 I am a little bit of a fabric hoarder and ALWAYS buy much more than I need for a project. One can never have too much fabric! The first thing I did was cut a few strips of each fabric in various widths and started laying them out until I found a pattern I liked. Then I just sewed the strips together. After I pressed the seams open, I cut out the backing and low-loft batting and basted all the layers together. 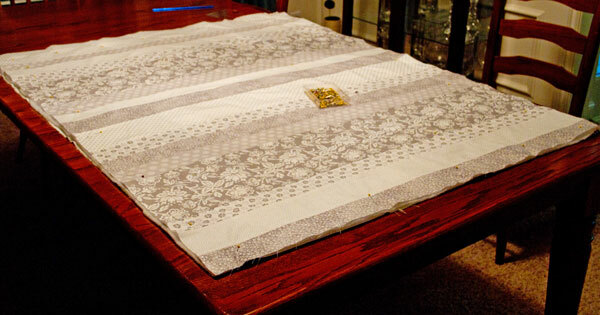 The next step was the quilting and binding. Since I had the time I decided to do the quilting by hand like I did on the Chevron Baby Quilt. 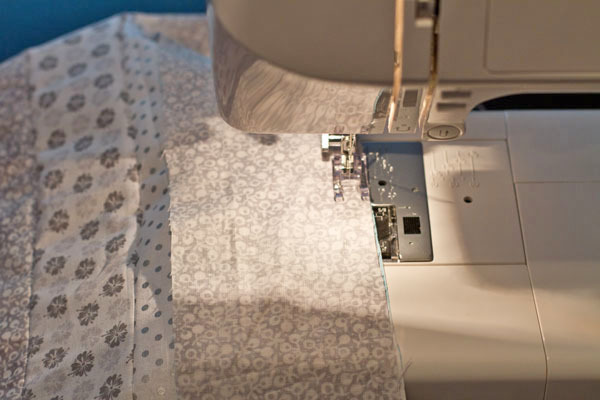 I am far from a perfect quilter but I like the look of handmade quilting and feel like it personalizes the quilt. Besides that, it gives me an excuse to watch tv without feeling guilty, at least I am being productive at the same time. Every quilt I make becomes my new favorite and this one is not an exception. I love the neutral colors and it was easy and quick to put together. This specific quilt I made for my physical therapist Christy that I talked about in this post. Now I have two more quilts to make in the next two months. I better get started right now! Theresa you always inspire me with all your well done projects! I love it…. You have been busy! 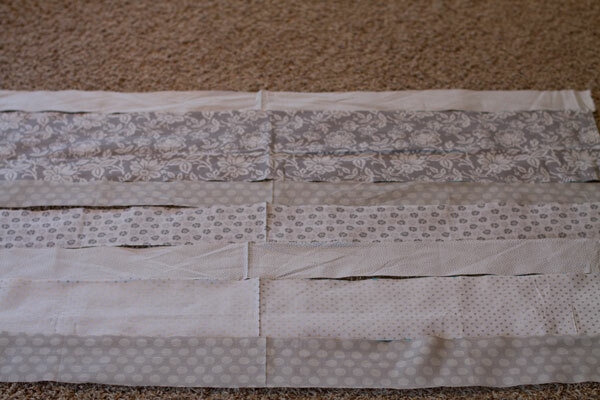 I have been wanting to make a strip quilt also, I already have the material just not the inspiration to get started. 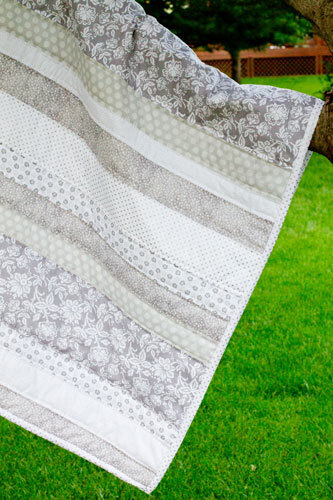 Seeing this beautiful quilt just might be the push I needed.